Bread pakora is a perfect tea time snack recipe, which goes best with tea. 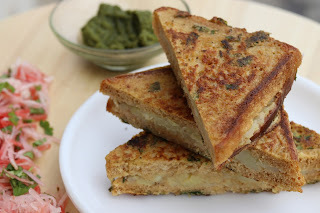 Here is a healthy oil free way to prepare these bread pakora stuffed with aloo/potato. 1. Stuffing - Mash potatoes and add all spices. Mix well. 2. Prepare a batter of gram flour, rice flour and water. The consistency should be flowing so it should be thin. Add all spices along with chopped coriander. 3. Place the potato stuffing on one bread slice and cover with another bread slice to make bread pakora. 4. Heat a tawa or griddle and coat with mustard oil for greasing. 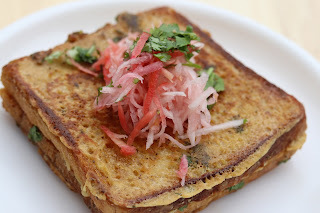 Dip the bread pakora in prepared batter and place on tawa. Cook on medium flame till one side gets crisp. Add little oil on all sides and flip over the pakora to cook from another side. Cook till both sides are crisp. 5. 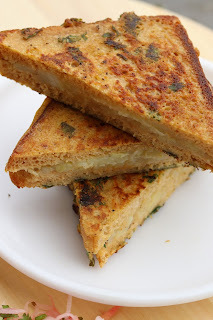 Cut the bread pakora into 2 pcs and serve hot with desired chutney or ketchup.